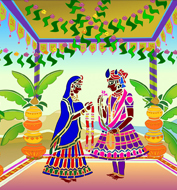 In the 17th century India, girls were encouraged to learn the folk art of Sanjhi. Girls would make paintings in that style and set them free in the river so that the universe blesses it. This was expected to bring suitable groom for the girls. This short film, using the same Sanjhi style, chronicles the story a girl’s father who journeys to find his daughter a suitable groom. Dhvani Desai began early, acting in children’s plays and appeared on TV and Radio as a child artist. After learning animation and working on a few films, she established her own animation studio, Metamorphosis. She is best known for her short animation film ‘Manpasand’ that won many awards globally. She has created many animation films and special effects for advertising films.